Stifado is a slow cooked beef stew combined with shallots, fresh tomatoes and a wonderful combination of red wine, cinnamon, cloves and garlic which gives this beef casserole a very distinctive flavor. 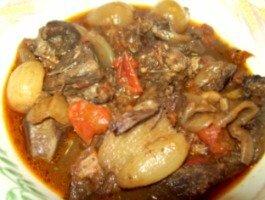 Authentic Greek Stifado, is the best greek style slow cooked casserole. Here’s our homemade version of this traditional winter stew made in Cyprus by Cypriots and Irish Me! The combination of Vinegar, Cloves and Cinnamon are pretty powerful flavours. I suggest you try a little bit of each to see how you like it first. Find the right amount according to your taste. If you don’t like any of these ingredients, just using red wine gives a great taste too. As an alternative, try a little allspice or nutmeg. I also like to use baby vine tomatoes as the sweetness blends really well with the spices. Shallots are very fiddly to peel, here’s a quick away for you. Put the shallots in a bowl, pour boiling water over and leave for a few minutes. When they have cooled a bit, pour off the water and the skins should easily peel away. You can use the same method to peel tomatoes if you prefer them skinned when cooking a dish. Let’s cook this succulient Cyprus beef casserole! 2. Add the meat, turn up the heat to medium and stir fry for a few minutes to brown and seal beef on all sides. 3. Now turn the heat down a little, add shallots and cook for about 5 minutes until their browning and slightly softened. 5. Add the red wine and 1 tbsp of white or red wine vinegar if you choose to use it. 9. When everything is combined add the tomato puree, mix well. 10. Lastly, add enough boiled water to cover the contents stir well. Lower the heat to a gentle simmer. Pop the lid on again and simmer the stifado until the meat is soft and the fluid has reduced to a thick sauce. Approx 2 hours depending on the meat. Note; If you need to add more water at a later stage of cooking, only use a little at a time. You don’t want to dilute the flavors. For a really slow cooked Stifado, transfer the mixture from the pot to a casserole dish with a tight fitting lid and place it in a pre heated oven set at a low temperature of 150c. It may take an 1-2 hours longer to cook but it’s soooo worth the wait. If you have a BBQ with a pull down lid. Transfer the mixture into an enamel casserole dish with a tight fitting lid and cook on a low setting.